As rehearsals begin for West Yorkshire Playhouse’s festive spectacular White Christmas, show sponsors Caddick Developments meet its lead cast members, to mark the start an ongoing relationship with the theatre. Acclaimed West End performers Darren Day, Oliver Tompsett, Emma Williams and Holly Dale Spencer play song and dance duo Bob Wallace and Phil Davis and the sparky Haynes sisters in this brand new staging of the Broadway musical, which takes centre stage in the Playhouse’s Quarry theatre from 24 November 2014 – 17 January 2015. 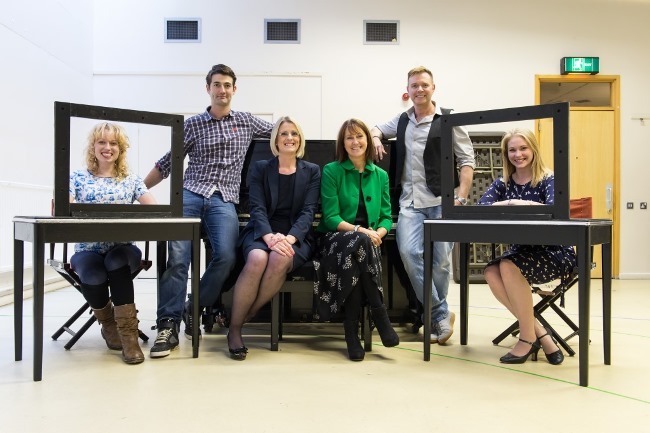 The celebrated actors were joined in rehearsals by Caddick Developments’ Senior Development Surveyor Sarah Friskney and West Yorkshire Playhouse’s Chief Executive Sheena Wrigley, marking the start of a new partnership between the organisations. Sarah Friskney said: “As a Yorkshire business we’re proud to be supporting West Yorkshire Playhouse with its major winter production, White Christmas, by becoming the main sponsor. Sheena Wrigley said: “We’re delighted to be producing a brand new version of this iconic musical with the support of Caddick Developments. “We have built a positive and supportive relationship with the team at Caddicks as they develop plans for their new site adjacent to the Playhouse building. West Yorkshire Playhouse’s new production of White Christmas is directed by Nikolai Foster, who returns to the Playhouse following the critical and sell-out success of ANNIE in 2011. The musical is adapted from the classic 1954 film starring Bing Crosby, whose beloved rendition of the title track is the best-selling single of all time. It brings together a cast of 17 musical performers and a creative team led by Annie choreographer Nick Winston, Tony Award nominated designer Matthew Wright, and Tony Award nominated orchestrator Jason Carr (A Christmas Carol), whose fresh jazz-inspired orchestration of Berlin’s score – including Blue Skies, Sisters and the legendary White Christmas – will be performed by an onstage seven-piece band. West Yorkshire Playhouse is a leading producing theatre, making ambitious productions and working with the best artists nationally to create inspirational theatre in the heart of Leeds. The Playhouse is committed to supporting emerging talent through its extensive artist development programme which includes graduate actor and director schemes. Alongside its work for the stage the Playhouse provides creative engagement opportunities with communities across Yorkshire, including its Youth Theatre, First Floor and regular arts sessions for older people, refugees, people with learning disabilities and people living with dementia. Caddick Developments Ltd specialises in the acquisition, development and management of commercial, residential and retail projects around the UK. Offering more than 30 years’ experience across a range of market sectors including commercial, education, industrial, leisure, refurbishment, residential, care, retail, mixed use and fit out. Cafe2U accelerates through first decade with outstanding financial results!